Home > Profile Articles > Mobility Goes International with a Mission to USA!! Between February 25th and 28th, 13 European startups and SMEs took part in an internationalisation mission to the San Francisco Bay Area, CA. 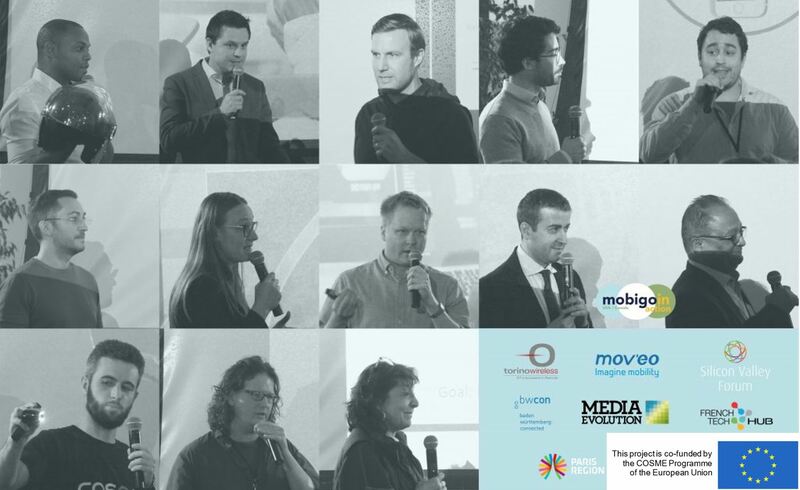 The 13 participating companies were selected by the Open Call 2 of the European project MobiGoIn-Action. The companies were accompanied by 3 of the 4 Clusters in charge of the project: Mov’eo, Torino Wireless and Media Evolution. French Tech Hub (FTH) and Silicon Valley Forum (SVF) were the US partners responsible for the organisation of the activities and the management of the practical aspects (mentors, contacts, visits, events, logistics, etc.). With the ambition to internationalise their activities in the smart mobility and automotive markets of the United States, the European entrepreneurs took part in a 4-days immersion program that included activities such as expert presentations, individual mentoring sessions, B2Bs, pitch evening in front of investors and industrialists and site visits. ApParkingSpot developed a new concept for renting and sharing parking spaces between organizations, individuals and businesses. A kind of Airbnb for car parking, including sensor technology to monitor the use of garages. CLEM specializes in electric car sharing, charging station management and car pooling. Leader in peri-urban and rural areas. Mobeelity has developed an intermodal platform bringing together public and private means of transport to optimize daily travel. Uses technologies such as AI for a better user experience, geo-predictive algorithms and an intermodal algorithm. Standard Development has created a sensor-based waste management system that automatically provides data on the fill level of garbage containers. The data is then processed in real-time to define the optimal lifting points and routes, and are then communicated to the collection trucks. KNOT is a self-service scooter service that allows you to travel easily on the last mile. Managed from a mobile app. PARK SMART has created an advanced video analysis embedded system that can indicate in real time the availability of parking lots in monitored areas, integrating video cameras. uConekt is a security company whose mission is to create a secure environment for those who expose their personal identity, providing access control, payment and personal identity services. It is meant to be used in the automotive sector with the uBolt. Cosmo Connected offers a safety solution for 2-wheelers (all types). An autonomous connected brake light with a built-in fall detector that alerts and automatically sends GPS coordinates to emergency services. During the 4 days we met plenty of partners, everything from investors, manufacturers, consultants, municipalities, large groups and startups who were selected according to the interests expressed by our European SMEs, while taking into account their respective sectors and degreed of maturity. We met: Alliance Ventures, Autotech Ventures, AXA Lab, Cisco, Conduent, County of San Mateo, DAHER, Ford, Founders Space, French Tech Hub, Get-Next, GrowthX, Hyundai CRADLE, Icebreaker Ventures, Ivy Mobility, KVB Partners, Workshop BNP Paribas, LEGALSV, Off the Grid Ventures, Orsay Consulting, Parsons Corporation, Perkins + Will, Plug & Play, Ride, Ridecell, Samsung Electronics America, San Francisco Municipal Transportation Agency, San Jose City, Silicon Valley Forum, TomTom, Top Funnel, Uber , Urban Radar, Valeo, Capital Ventures, Volta Industries, Wards Intelligence, Zipcar, Zoox. We would like to thank all SMEs that participated to this mission! And all partners who contributed with their insights and knowledge! This experience was so valuable and we have developed good relationships with both the service providers and the local networks that we met.